Shop For Your Petite Jeans Inseam 27 Just Here! Inseam 27" is equal to 68-69 cm. It is not that easy to find them in stores, but it still is possible with a little bit of effort. However, it takes quite a long time and patience to look through among many petite clothing webstores offering women's petite size jeans. I have been all over the web and found these jeans from various international stores, hoping that you can find the one you are looking for just here. Good luck with your search. Where To Look For Petite Jeans Inseam 27 "
At 6PM it's a no-brainer to find your right-fit petite jeans, as you can narrow them down by clothing size, waist size, jeans fit, pant style, brans, inseam length, color, price, theme and more. 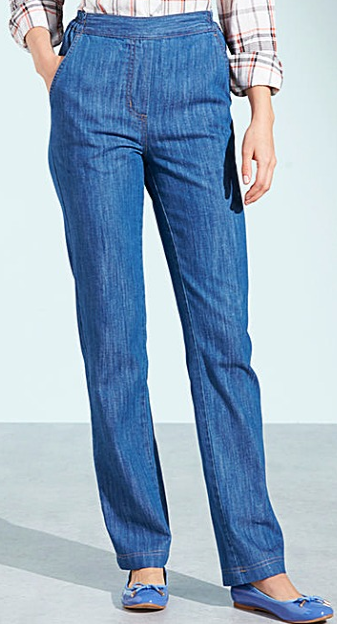 You can find jeans inseam 18" through to 34'5", which includes all your petite inseams. Bloomingdales is the place to be if you are looking for Citizens of Humanity or Eileen Fisher jeans, as well as Paige Denim, 7 for All Mankind. Dorothy Perkins has the best collection of skinny jeans in petite length. 100 shipping destinations. Marisota's jeans for petite women are of inseams starting from 25" and including jeans 27" inseams. Their sites are dediacted to US and UK customers separately. Check JDWillaims for US deliveries. Simply Be is a store with women clothes in sizes from 10 to 28. They carry jeans for petite women in many short inseams including inseam 27". They have separate sites for UK, Germany, EU and US. This link will take you to the US website. And then you can choose other countries if you wish. Zappos petite jeans section features jeans from AG Adriano Goldshmied, Hudson, Joe's, Versace and many other famous brands. This link will take you to 27" and 27" 1/2' inseam jeans. However, you can find many other petite inseam pants and trousers. You just need to choose by many categories to narrow down your search. You can find jeans for any budget starting from around $40 up to hundreds of dollars. Their short inseam jeans collection is rich for colors and styles.